Alicia Keys Photos, News, and Videos | Just Jared Jr.
Demi Lovato looks stunning at 2017 WE Day! The 24-year-old donned a gold silk dress while stepped out to celebrate young people changing the world at The Forum on Thursday (April 27) in Inglewood, Calif.
Also in attendance that afternoon were Shay Mitchell, Lily Collins, Alicia Keys, Jessie J, Laverne Cox, and Josh Gad. FYI: Shay is wearing a Cushnie et Ochs top and pants, XIV Karats jewelry, and Balenciaga shoes. Charlie Puth eyes the camera during an event with CustomInk for the yearly “Be Good to Each Other” Bullying Prevention Campaign at Mondrian Hotel on Monday (August 29) in Los Angeles. On Saturday, the 24-year-old singer spent some time in the studio with Alicia Keys, and they recorded a beautiful duet to the song “Whip Appeal” by R&B musician Babyface! “I might be in the studio with @aliciakeys and we might be singing @babyface,” Charlie captioned the Instagram vid he shared. Charlie grins when he forgets some of the words and has to improvise, but the two harmonize perfectly – check it out below! Miley Cyrus Sings with 'The Voice' Coaches - Watch Now! Miley Cyrus poses for a picture with her fellow The Voice coaches in this new photo from the episode, which aired on Sunday (August 21). 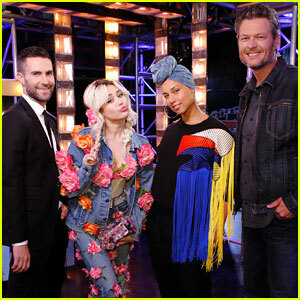 The four coaches – Miley, Adam Levine, Blake Shelton, and Alicia Keys – performed “Dream On” by Aerosmith for the show! They each showed off their vocals during a different section of the song! Watch the amazing performance below. The Voice returns for a brand new season on September 19 on NBC. Be sure to check it out! Miley and Alicia are first time coaches on the show this season. 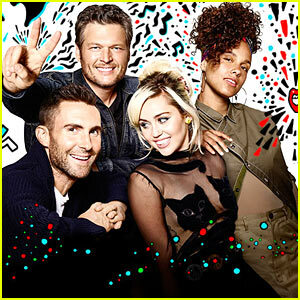 Miley Cyrus is Shaking Things Up in Season 11 of 'The Voice' - Watch! These female powerhouses are taking over The Voice! 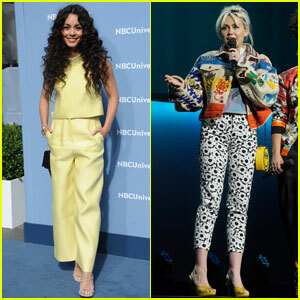 Miley Cyrus and Alicia Keys will be joining veteran judges Adam Levine and Blake Shelton in the upcoming season of the hit singing competition show. This is the first season where two female coaches will train their teams of singers. In the latest trailer for The Voice, we hear what Miley and Alicia will be bringing to the show. “Miley’s the youthful spirit we’ve been missing,” Adam said. Season 11 of The Voice is set to premiere on September 19 at 8 pm on NBC. Vanessa Hudgens is pretty in pale yellow while attending the 2016 NBCUniversal Upfront Presentation on Monday (May 16) in New York City. The 27-year-old actress was there promoting her new show Powerless in which she plays Emily, a spunky young insurance adjuster specializing in regular-people coverage against damage caused by the crime-fighting superheroes. Also in attendance were new Voice coaches Miley Cyrus and Alicia Keys. FYI: Miley is wearing a custom Chemist x Chain Gang jacket, custom Floyd shirt, vintage Moschino jeans, and Melissa shoes. Vanessa is wearing a Monique Lhuillier outfit, Stuart Weitzman shoes, and Jacquie Aiche jewelry.